It has been many years since on the forums, I'm back in it, and happy to have moved to a much bike friendly community again! What's everyone thoughts around the '14 CAAD 10 105 group package? Offer is at $800, looks in great condition. Also, gent is offering $400 for Reynolds Strike 62, but for me, feels over kill for my needs, unless it's too good to pass up? Over 10 years ago bought my first fixed bike, loved it put many thouands miles on it. My dream was to get a CAAD for serious riding. Good Triple butted Alu frames can be as comfortable and stiff to ride as a cheap carbon, sometimes better. CAAD's are some of the best Alu frames you can get. 105 is a great groupset. Quality without breaking the bank. If the wheels are cheap may as well get them, saves you feeling the need to upgrade at more expense down the track. Never buy a bike you can't ride first. In fact, there is the exact same bike at 52 cm much closer that I can go try first to get the feel for size. But at my 5'6" height, my guess it will feel too large and will need to slam the post and change up the stem.. Agreed, I'll make the 4 hour trip out there, I can't be the only one here who has driven 4 hours to try a bike? 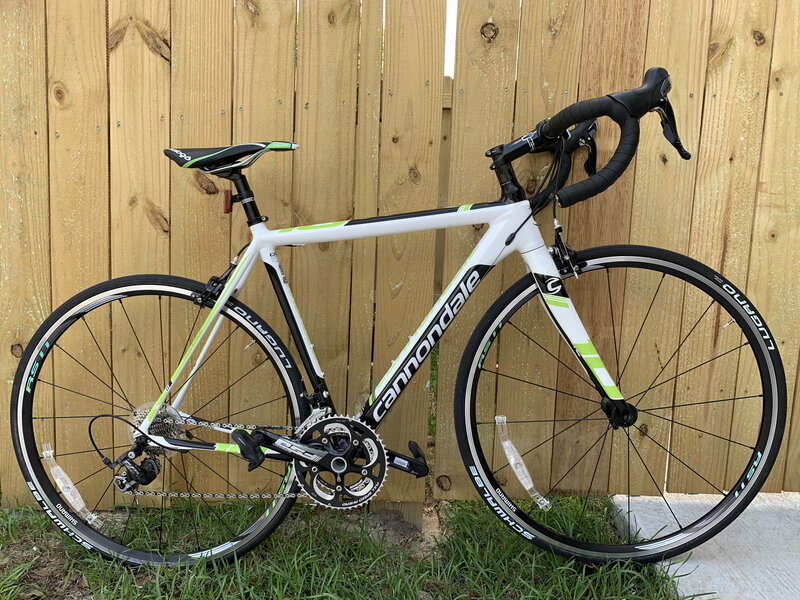 My dad purchased a 2014 CAAD 10 105 new, I test rode it and took have around 200 miles or so on it. It's an amazing bike, fast, light and comfortable, much more comfortable than my 2013 SuperSix (non evo). The only parts I did't like were the Tekro brakes and the Schwalbe tires. It's super capable and worth upgrading. I'm 5' 7" and all of the Cannonades I have owned have been 52cm and fit me perfectly but definitely go for a test ride before you buy. You know I found another at $900 condition listed as new at 52cm, so tough to believe it is a new bike now that it is 5 years old? Anyway, the 52cm is much closer distance and will give it a test ride as you and illdrag02 suggested, if too big I'll have the option to go down the size. Appreciate keeping me true to the test ride. My competitive cyclist measurements has me right in-between sizes but a little closer to a 52cm for the TT. All the forum research I could get matches results you mentioned for your height close to mine matching a 52. Also understand the lacking brakes and wheel, but more importantly, I have been on a fixed for years, can only imagine it's a huge step in the right direction. Mostly the reason committed to the CAAD is always wanted one since I rode the CAAD 9 many years ago at the LBS and second hand is too good a deal to pass. Before you jump at the deal, keep in mind that there are still some brand new 2018 CAAD12's with the 105 groupset around. I think incycle.com has them for $1,250. Btw, I'm 5'6" with a 30" inseam. I was fitted for, and ride, a 52cm CAAD12. For me, the 50cm felt a little cramped. Last edited by Robert A; 04-08-19 at 03:21 PM. Thanks, I think the CAAD 10 is sufficient for my needs for now and really want to take advantage of second hand for getting back in it. Thanks for the heads up, did call and they ran out of 52's at incycle. I'm exactly 5'6" with a 30" so that is reassuring! I have a 2014 CAAD10 and love it. Except, as I understand it, the following (and final) CAAD10 was the upgrade from 5700 105 to 5800, with 11 speed. And Mavic Aksiums and a Si Crankset instead of the RS10s and FSA. Not that the wheels and cranks are big upgrades, if they're even "upgrades," but I'm a sucker for (some) labels. I would echo the comments above about the Schwalbe tires, but happily they wear out quick and you were going to put Continentals on after about the first 1,000 miles anyway. I also hated the Prologo saddle, but I accept that this may be a purely personal item. I can't say enough good things about the frame, though. It's a quality bike, and I've ridden carbon that wasn't a patch on it. My son bought his Caad10 new in 2015. It has at least 20,000 miles on it. He started racing last year and is competitive with it. They are very good frames. Period. You will really like it. disk brakes mean nothing in the real world, and make zero difference in racing. Some will argue you can go into turns a little hotter, but really, I have not seen this make any difference at the races. I work at a Cdale dealer on the weekends and it seems a 50cm may be short in the TT for you unless you have a short torso. Get the Reynolds wheels. You will want them eventually. Bought my CAAD 10 105 in late 2011. 24,000 miles or so and it rides better than ever. 75 miles today. Can't recommend one highly enough, I love riding it. If it's in excellent shape $800 isn't too much. Careful about the sizing. 50 may be too small. I'm 5' 11" w 34 inseam. My 58 is not too big for me. Let us know how you make out. Hi everyone, thanks for the feedback. After taking others advice, I utilized the competitive cyclist bike fit and it also steered me to the 52 cm as others mentioned. I ended up getting the 52 cm. What an incredible ride! Also, quite a lucky history, the bike was actually brand new from storage. The family closed their shop and is soon to move out of state and had this "old bike," but it was actually brand new! So I am the first owner of this 2014 CAAD 10 5! 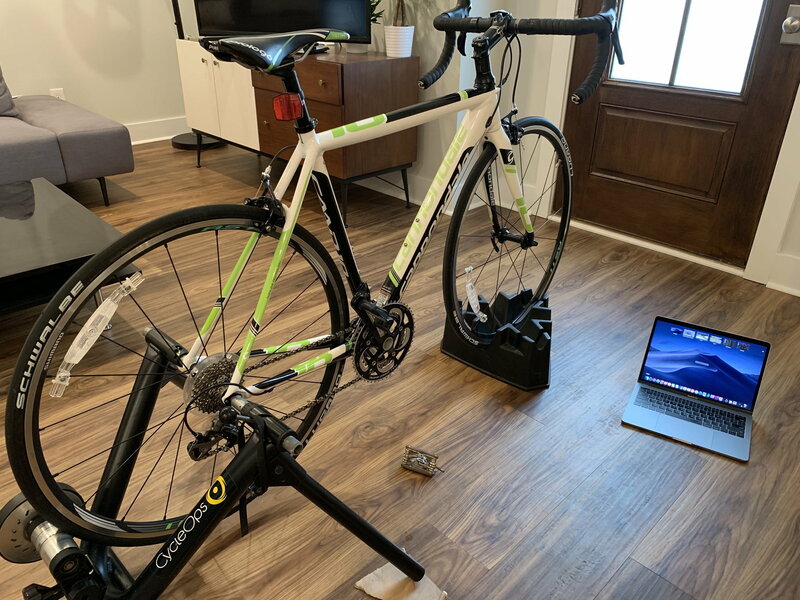 I even got to snag my first trainer for $20 it's the CycleOps so learning more about this. Made out $900 for it all. Photo with her in all her glory. The frame fit is great, the reach is a bit long, believe a shorter stem and less angle may get me to perfection. That's a beauty! Congrats. Great news on it being new also! That's a real score and a beautiful bike. Congratulations! That stem looks a little long for that frame size, so you've got some room to play with. Nah, do what's comfortable. I upsized my stem to a 120mm on a 54cm frame. Set a bunch of Strava PRs on my next ride and never looked back.